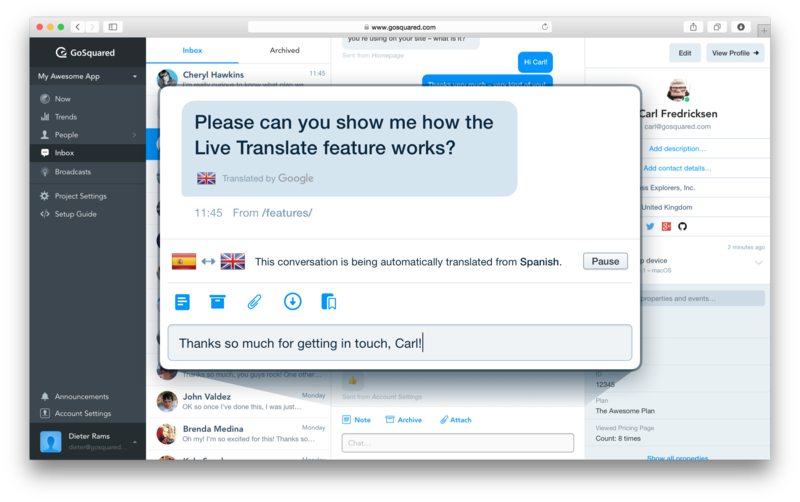 Live Translate is a feature that automatically translates incoming live chat messages into your team’s preferred language – and then sends messages from your team back in your customers preferred language. To start using it, just head to Settings > Current Project > Assistant and scroll down to find the Language Settings. Then just toggle on Live translation. This is the language that incoming messages will be translated into for your shared team Inbox. It is also the language that the Assistant interface will be displayed in for visitors on your site. 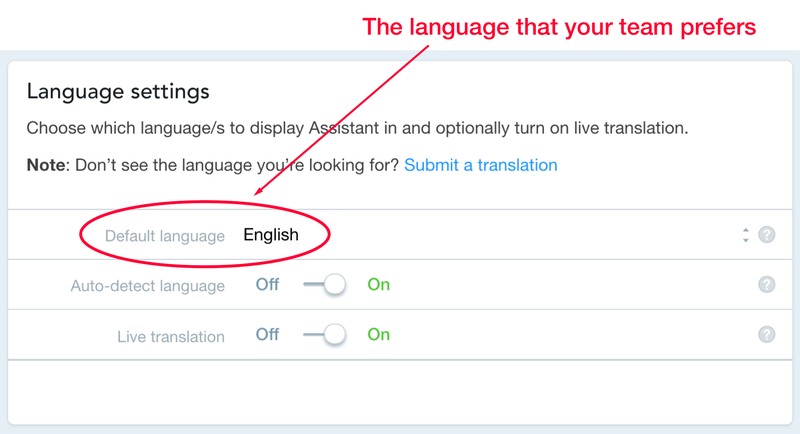 Note: turn on Auto-detect language if you want the Assistant interface to also be automatically displayed in your visitors preferred language – currently supports 18 languages. When will messages be translated? When a visitor sends you a live chat message, GoSquared detects the language that the visitor’s browser is set to. For example, if a visitor is using the Spanish version of Google Chrome, GoSquared will detect that they speak Spanish. If your team's preferred language is different to the visitor's browser language, then live translate will automatically kick in (assuming you have Live Translate turned on). You can easily see when this happens because the translation bar will appear in your conversation like below, and every translated message will have a little flag icon in it. What happens if the translation goes wrong? Automatic translation is getting better everyday, but occasionally it can get tripped up by slang words or typos in the message. If you suspect this has happened, you can click the the little flag icon in the message bubble to toggle between the original message and the translated version. If for some reason you'd like to stop messages being translated in the current conversation, you can just hit the pause button in the translation bar. This will prevent any future messages from being translated until you or a team member decides to un-pause.